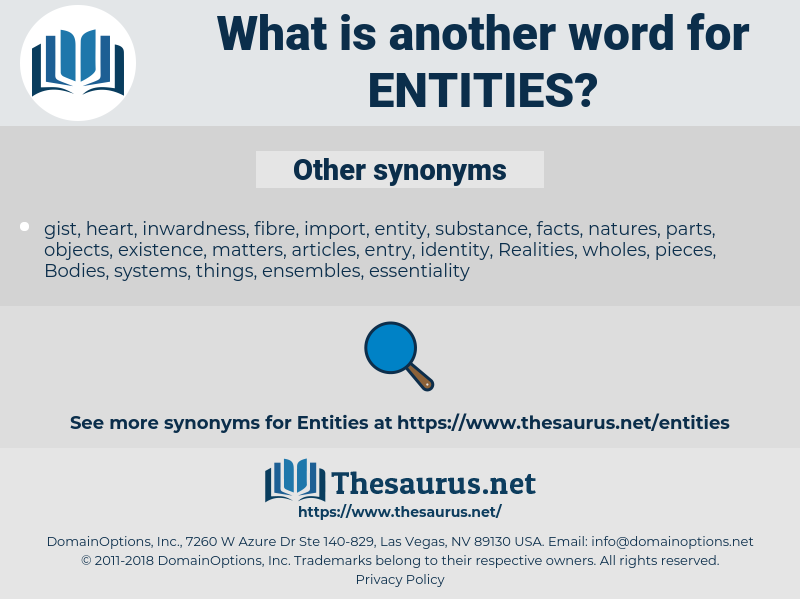 What is another word for Entities? Identities, Personalities, Constituencies, entrants, affiliates, administrations, agents, Companies, Operators, contributors, districts, principals, actors, blocs, states, jurisdictions. 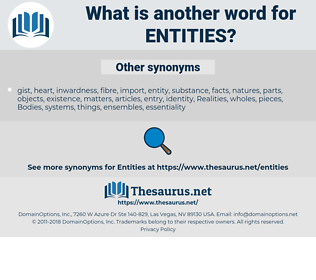 enterprise, enterprises, entreprises, entidades, Undertakings, ventures, statistics, names, Carriers, Industries, subjects, players, Firms, SMES, RFMOs, organismes, organs, beings, Persons, people. community, organizational, system, structures, institutional, government, components, parliament, providers, commission, participating, organismes, individual, individuals, sector, personnes, organs, world, points, beings, financial, united, boards, division, person, Persons, personal, groups, biota, processes, ec, people, features, social, april. enterprises, Realities, entrepreneurs, entreprises, end-entities, Communities, partnerships, Societies, constituents, representatives, conglomerates, utilities, requirements, entidades, operations, Facilities, certification, organizsations, arrangements, Capacities, governmental, matters, contingents, Clients, designated, registered, systems, participants, Undertakings, transactions, substances, secretariat, groupings, concepts, Activities, instances, collectives, Administrators, microorganisms, credentials, applicants, Entries, Patients, settings, Properties, creatures, destinations, counterparts, interests, configurations, broadcasters, partners, ensembles, statements, items, endeavours, issues, protagonists, mechanisms, locations, proportions, proceedings, Dependencies, combinations, appliances, networks, elements, ventures, cooperation, Respondents, operatives, amenities, sites, Dignitaries, regulators, candidates, installations, formations, embankments, machineries, perpetrators, objects, belonging, mandates, Households, committees, suppliers, Governments, certified, channels, pieces, commissions, stakeholders, regions, frameworks, segments, custodians, settlements, names, flexfields, sections, banks, directions, auditees, procedures, factors, Categories, Trustees, Foundations, fittings, contractors, sectors, concerned, buyers, tribunals, factions, types, tenants, patterns, Carriers, traders, applications, developments, ministries, spheres, purchasers, fractions, allowances, quarters, Apparatuses, others, topics, venues, dealings, ways, passengers, Vehicles, species, servants, articles, Movements, themes, presences, Industries, services, Arenas, effects, fields, employers, sponsors, teams, needs, credits, holdings, subjects, precursors, Conferences, clusters, constructs, parts, panels, Branches, personnel, devices, players, aspects, councils, brokers, acteurs, NGOS, Economies, Firms, regimes, users, rules, ethics, concerns, outlets, trusts, chambers, targets, centres, Assemblies, tasks, peoples, organes, nations, Vendors, dikes, SMES, makers, courses, audit, circles, Trainings, Donors, Missions, employees, nominees, actives, programmes, Voices, materials, values, who, Records, Areas, AES, sets, Monopolies, funds, vessels, schemes, empresas, platforms, forces, holders, fabrics, Workplaces, Faces, stages, officials, shapes, sources, Chests, PAGES, moral, modules, Ones, levels, packages, Forums, Fora, troops, Does, attempts, plans, farmers, arms, workers, Plants, flats, kits, figures, RFMOs, members, Guards, spaces, sides, loans, powers, Elles, Cells, speakers, shall, Drives, courts, officers, offices, pools, ;, Sports, blocks, morals, unions, cases, Boxes, clubs, changes, Carcasses, amounts, Programs, Morales, structures, walls, backgrounds, Classes, places, Schools, embassy, LINEs, farms, 2003, components, providers, organismes, individuals, personnes, organs, points, beings, boards, Persons, groups, Cas, processes, people, features.